Pillay is based at the University of Free State, where she lectures curriculum studies and social justice education. Her research interest is school curricula, specifically commerce textbooks, to unveil ideologies of about how instructional materials shape representations of sexuality and gender. In her downtime she presents seminal talks in rural schools around the Free State on issues of social justice and empowerment. Pillay studied at the University of KwaZulu-Natal, completing a Bachelor of Education in 2010. She subsequently did an honours and master’s in education. In 2014 she was granted the National Institute for the Humanities and Social Sciences Doctoral scholarship. 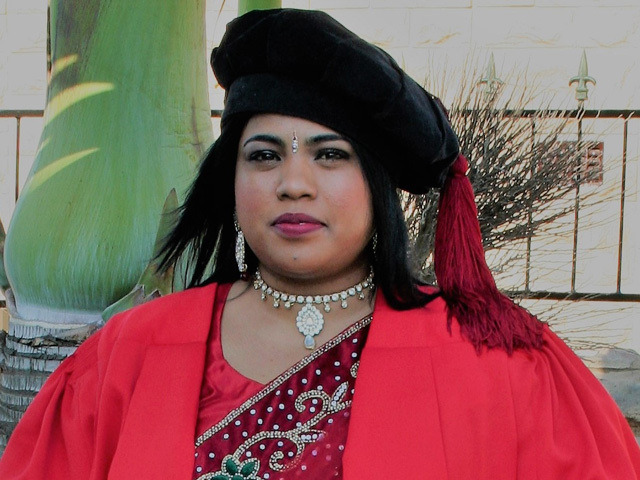 Pillay’s PhD examined the constructions of gender in business studies textbooks used in four Southern African countries, revealing that management and entrepreneurship is scripted almost exclusively in favour of men. During the three years of her PhD studies she presented her research at various conferences, both internationally and locally. Last year she also presented a paper from her PhD at the world’s largest education research conference — American Education Research Association — in Texas, USA. She has also been invited to the Georg Arnhold International Summer School, which will take place in July in Braunschweig, Germany.